Rachael Kirkup is the Streetlaw Supervising Solicitor for BPP University Law School’s Pro Bono Centre (“BPP”) and manages a free public legal education project designed to empower members of the public by making them aware of their rights and responsibilities as citizens in a democratic society. 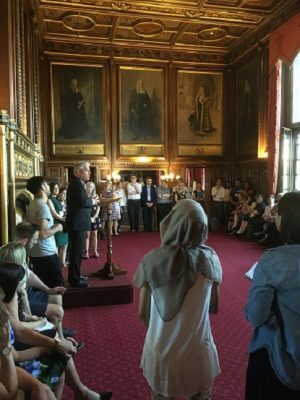 Rachael attended the Teachers’ Institute at the Palace of Westminster on 2 – 4 July 2018, an intensive three-day course looking at how we can engage young people with Parliament. This was a question posed by the Rt Hon John Bercow MP on my first day attending the Teachers’ Institute (‘TI’) – and one I am itching for our Streetlaw volunteers to put to schoolchildren around the UK come Autumn term! The TI is a free training programme that brings together 70 teachers working in primary, secondary and further education across the UK, all eager to learn how to make Parliament more accessible for young people. This begs the question: why bother? I often hear that youngsters are apathetic about political issues, but firmly refute this idea. Just ask any child of school age for their opinion on an issue of local, national or global importance (whether that be funding for a skate park; increased support for cyberbullying victims; or how big, exactly, the “Trump Baby” balloon ought to be….). I’ll bet all the meat pies in my hometown of Manchester that said schoolchild will vehemently argue their case! Yet, this passion isn’t translating to the ballot box: estimates produced by Ipsos MORI following the 2017 general election spoke of an 84% turnout rate from the over 70s, vastly overshadowing a 54% turnout rate amongst 18 to 24 year olds. So, why the disconnect? Anecdotally, what my Streetlaw student volunteers and I hear from youngsters we meet through outreach projects we deliver in schools, pupil referral units and youth offender institutes, is this: I don’t understand why Parliament has direct relevance to my life. Or, as one cheeky Mancunian more bluntly put it: “What do those crusty old guys working in that crusty old building in London have to do with me?” (in many ways, a fair question, since the average age of a Peer in the House of Lords is a ‘positively youthful’ 69!). I applied for the TI in the hope of equipping myself and my Streetlaw student volunteers with more knowledge and confidence about how to tackle such disillusionment amongst young people. I admit to approaching the conference with a degree of scepticism: given the UK’s increasingly aging population, would Parliamentarians truly care about capturing the youth interest/vote? Three days later, I left Parliament somewhat weighed down by a pile of lesson plans, but buoyant with the notion that a visit to this opulent building could prove to be an inspiring – rather than intimidating – encounter for young people. The TI was organised with military precision and exposed us to many aspects of Parliamentary work. The first day of the conference kicked off precisely 90 years to the day that the Representation of the People (Equal Franchise) Bill became law – a timely reminder that the right to vote was so hard fought for. We toured the Palace of Westminster; put questions to MPs and Peers; and watched debates in chambers. The Speaker of the House of Commons talked of efforts to modernise Parliament, whether that be ridding itself of its rifle range or introducing an on-site nursery! Others spoke candidly about the need for further reform if Parliament is to be truly representative of the community it serves (and to appeal to youngsters in particular): discussion ranged from removal of the remaining hereditary peers, to a ‘roaming’ Parliament, through to voting by proxy for MPs with family commitments. I was struck by the sincerity of those working on Select Committees and their evident desire to hold the Government to account and have an effect on public policy. Meeting these individuals made me realise that schoolchildren put off by the ‘braying’ and bravado displayed at PMQs, could find alternative ways to pursue a career (or just take an active interest) in politics. Importantly, I learnt about numerous ways children yet to reach voting age could make an impact – for example, by signing an e-petition calling for the abolition of university tuition fees or emailing their local MP demanding support for a ban on microbeads. It was particularly inspiring to meet so many teachers who, in the face of heavy workloads, tight budgets and high stakes testing, remained passionate about putting civic engagement at the forefront of their pupils’ learning experience. Recent TI graduates returned to share a myriad of ways in which to embed active citizenship into school life: from running mock elections; to setting up school councils; to Skyping the Speaker or visiting the Parliament Education Centre. An overarching theme of the workshops was the need to identify issues that resonated with children personally, and to give them ownership of the matters they wished to discuss, debate and campaign about. Young people do care about politics, but not all of them know how to get their voice heard – or believe it is being listened to. Three days immersed in Parliament at the TI has convinced me that BPP’s Streetlaw project can help them find that voice. I’m optimistic theirs will be a generation that will, indeed, shape politics, rather than be shaped by it.